Preparing audio for online distribution can be tedious and frustrating. Sonnox's affordable utility takes the pain away! 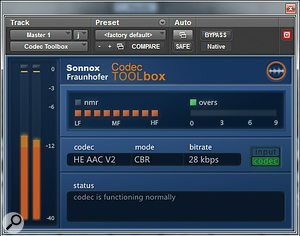 Back in 2011, Sonnox teamed up with the Fraunhofer Institute to develop Pro-Codec, a plug-in designed to integrate the process of creating and auditioning data-compressed audio into professional DAW and mastering environments. Pro-Codec allows the user to switch in real time between up to five different compression codecs, with comprehensive metering to show what they are doing to your signal, and a very neat ABX system allowing you to audition the results in a blind comparison. It even lets you audition the 'difference' signal between the source and encoded audio, so you can hear what the encoding is throwing away. Mike Senior gave this innovative and very useful plug-in a deservedly glowing review in SOS August 2011 (/sos/aug11/articles/pro-codec.htm), and it remains an invaluable tool for mixing and mastering engineers who are serious about making their product sound as good as possible in every consumer format. Being a plug-in, however, there are limitations as to what Pro-Codec can achieve. It has limited support for adding metadata and no facility for editing it after the fact; and although it can encode the same file in multiple formats simultaneously, it does not support batch processing of multiple files. Moreover, an investment of several hundred poundsdollars is hard for many home and project studio owners to justify. 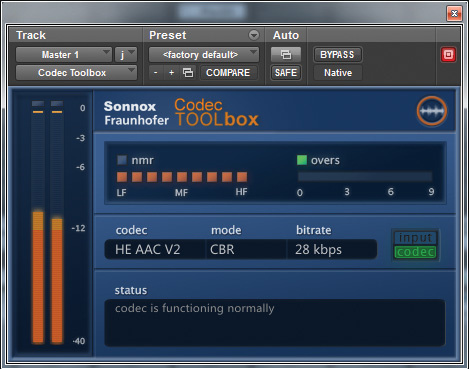 These considerations have led Sonnox and the Fraunhofer Institute to develop Codec Toolbox, a much more affordable alternative that also addresses the above-mentioned limitations. Codec Toolbox contains two elements. One is a very much simplified version of the Pro-Codec plug-in, while the other is an offline application that handles batch conversion and lets you write and edit metadata. 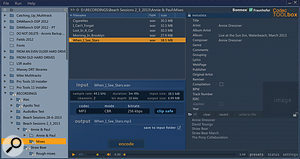 Codec Toolbox is authorised to an iLok account; the licence can be stored on a second-generation iLok key or on your computer. The plug-in component of Codec Toolbox is compatible with AAX Native, VST, RTAS and Audio Units hosts on both Mac OS and Windows. Compared with Pro-Codec, its functionality is pretty basic, but still more than adequate for most people's needs. In essence, you place Codec Toolbox in the last insert on your master bus, whereupon you can select a single codec from a list comprising MP3, AAC-LC, HE-AAC, HE-AAC v2, MPEG Surround and, on Macs only, the Apple AAC iTunes+ format as used in 'Mastered for iTunes' files. A simple switch lets you select whether to audition the input or codec output — there's no blind ABX testing here, and if you want to audition the 'difference' signal, you need to arrange this within your DAW. Nor do you get fancy metering; there are basic but effective level meters to the left, plus two other simple visual devices giving you feedback about what's happening to your music. The first of these is a set of nine LEDs representing different areas of the frequency spectrum; Codec Toolbox analyses the difference between the input and the codec output streams, and where the codec is removing significant content from a particular frequency band, the corresponding LED will turn orange. 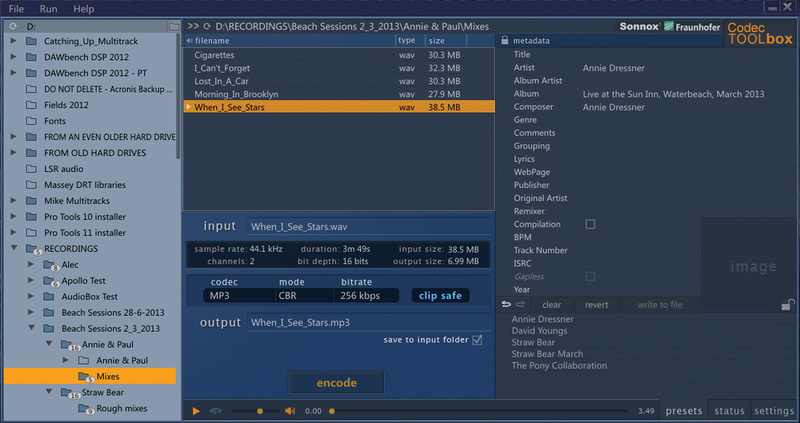 Listening to the processed audio is only possible because Codec Toolbox includes a decoder as well as an encoder, and the role of the second meter is to indicate clipping in the decoded file that could potentially be problematic. The Codec Toolbox plug-in is simplicity itself to use, and despite its simple feature set, I think it does pretty much everything you'd want in such a plug-in. I found that its warnings of possible degradation in different frequency bands coincided pretty closely with what my ears were telling me, and I didn't really miss the ability to audition multiple codecs simultaneously. Codec Toolbox Manager is a stand-alone utility with a no-frills interface that is clear enough, though I'd have liked it to be resizable. It provides a file browser on the left-hand side, and once you've selected a folder, any audio files in supported formats appear in the window top centre. Selecting one of these files makes it the 'input'; you can Ctrl-click to select multiple files, but only if they are in the same format. It's not possible to rename or delete files here, though. Once selected, you'll see information about the file's sample rate, duration and so on, and any metadata within the file will be displayed in the editor to the right. Changing or adding metadata tags is as simple as clicking, entering text, pressing Enter and hitting Write to File; tags that aren't supported in AAC are greyed out. You can also add cover art simply by clicking in the 'image' field and selecting a suitable file. An arrow next to a filename in the input section indicates that a particular file is ready to be played back by Toolbox Manager's media player, the controls for which run along the bottom. Toolbox Manager doesn't include the ability to A/B input against codec output that you get in the plug-in, the assumption being that you'll choose your codec settings at the mixing or mastering stage rather than afterwards. Once you've entered metadata, you can store it as a preset, and sensibly enough, if your preset contains empty tags, these won't overwrite any information previously added. So, for instance, if you set your preset to include artist name, composer and album title but not song title, applying that preset to an existing file with a song title will keep the title intact. I would also have liked the option to pick up filenames as default song titles, but as it is, the field is blank unless you enter something. Something about the way the interface is designed meant that I often forgot to hit 'Write to File', Codec Toolbox Manager features a Clip Safe option which will ensure that your encoded audio does not produce overloads on decoding. erroneously assuming that simply hitting Enter after editing a tag would add it to my file, but mercifully, a friendly pop-up warns you when you're about to navigate away from a file with unsaved metadata changes. You can add or modify metadata for multiple files simultaneously, and so it is with encoding, as long as you want them all to be in the same destination format. Codec, mode (constant or variable bit-rate) and bit-rate are selectable using pop-ups, whereupon you choose a destination folder and hit the 'encode' button (or press Ctrl+P). Encoding is impressively quick — it seemed to me quite a bit faster than in iTunes, for instance — and of course any mistakes in your metadata can easily be rectified afterwards. As a result, encoding entire albums with appropriate metadata is as easy as falling off a log, and for modern mastering contexts where there is often a need to prepare numerous different formats, Toolbox Manager has to be a huge time-saver. Oh, and like the Codec Toolbox plug-in, it will warn you if your decoded audio is likely to clip, and even includes a Clip Safe mode that encodes and decodes the audio, figures out how much gain change is necessary to avoid clipping, and then re-encodes it with that gain change applied. For the vast majority of users, I think that the combination of the Codec Toolbox plug-in and the Toolbox Manager application covers everything that needs to be done with audio data compression, and more. In the ordinary line of events, there's little practical need to encode in the obscure formats or high sample rates and word lengths that are possible with Pro-Codec, and although it's perhaps a shame that you can't 'plug in' additional codecs, that's hardly surprising in a product that was developed in conjunction with the Fraunhofer Institute. Best of all is the price. At a mere £42under $60, this really is a product that everyone can afford to own, and one which a great number of people really should own. That even applies to existing owners of the Pro-Codec plug-in, who I'm sure will find the batch-processing and metadata editing features of the Toolbox Manager application invaluable. Codec Toolbox is one of those products that won't improve your recordings or mixes, but can do a hell of a lot to preserve the good qualities they already have! Allows batch conversion and editing of metadata in existing files. List of supported codecs can't be extended. Interface is a little basic in some respects. If you prepare audio for the Internet — and who doesn't these days? — this is one Toolbox that you really can't afford to be without.